If you want a challenge in your faith walk, I recommend reading the biography of a remarkable man, Mr. George Mueller, the founder of homes that housed thousands of orphans in the 1800s in Bristol, England. This book gives a detailed look at the life of Mr. Mueller from one who was greatly influenced by Mueller in his spiritual life. This pastor from America, Arthur. 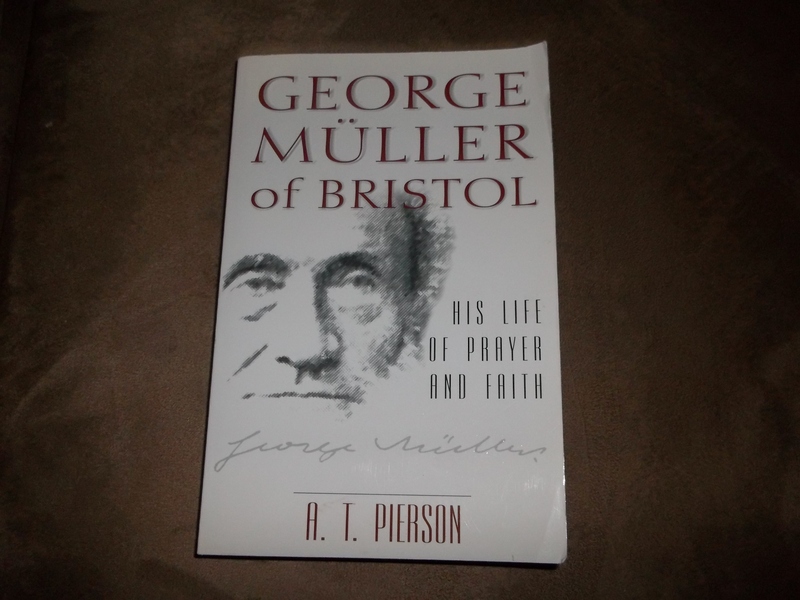 T. Pierson, was a personal friend of George Mueller. The story is outstanding not because of George Mueller in and of himself, but that he proved in his life and ministry that God was a prayer hearing and answering God. He sought first of all that God might be glorified in answering his fervent prayers for the many needs of his ministry. In fact, everything Mueller accomplished for his ministry (which grew steadily from humble beginnings) was not from going to people as a source but instead was accomplished through fervent prayer. Mueller chose never to broadcast a need for his orphanages to anyone, however, but only to God. Even all his helpers were not allowed to broadcast any need, but only to petition heaven for their needs. How different this is than the approach used today with ministries having telethons and begging for money. Many times Mueller, his wife and his helpers were sorely tested and lived in poverty themselves as they gave just about everything they had for the sake of the work. Reading these testimonies, it really put me to shame, to be honest. These workers sold all they had for the sake of the work and did not count their lives dear unto themselves,just like the Apostle Paul said of himself in the book of Acts. Another important takeaway from this biography is to learn George Mueller’s Bible reading habit and of making himself happy in the Lord as the first order of each day. What a beautiful idea, to start each day making sure that one is happy and content in their relationship with Christ as the most important thing. He read the Bible through two hundred times during his lifetime. George Mueller lived like the faith heroes of Hebrews 11, therefore his faith and life of prayer is worth imitating today. This book was published by Kregel Publications in 1999. Wouldn’t it be nice if life was as easy as following the advice in this precious board book, tested and approved by my grandson to bring delight to little eyes? 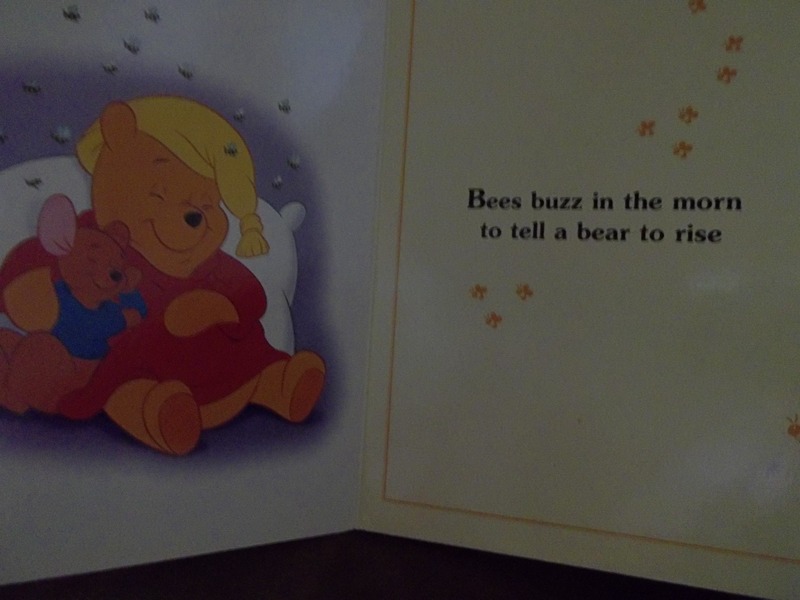 It starts out with, as you can see, “Bees buzz in the morn to tell a bear to rise.” This is time for Grandma to act rather foolishly and pretend she is a bee and tickle little grandson under his chin, making bee noises. The next lines in the book become rather Ben Franklin-ish, saying that a bear who stays in bed will never be wise. The next page encourages Pooh bear to enjoy his day, and not to dawdle on the way. The kicker is on the following page, the Pooh Bear is to hum and not act glum. When I get to the word “hum” I start humming vociferously. Then, by humming and not acting glum, he will have lots of friends and things will work out in the end. The last page says the old Ben Franklin proverb of early to bed and early to rise can make a bear be successful in his endeavors. Doesn’t it you make you wish a happy life could be obtained as simply as that? Getting up early, enjoying your day, humming and not acting glum? These are all good suggestions for little ears to hear. Maybe I should try them all more often! The way this little board book rhymes makes for lots of fun using lots of inflection. When I put the book up close to my grandson’s face, he seemed to light up. I read to my own kids a lot when they were little, but it seems I even enjoy it more as a grandma. And it is never too early to start reading to babies, IMO. I found this book at a library book sale, it is copyrighted 1999 by The Pooh Properties Trust. 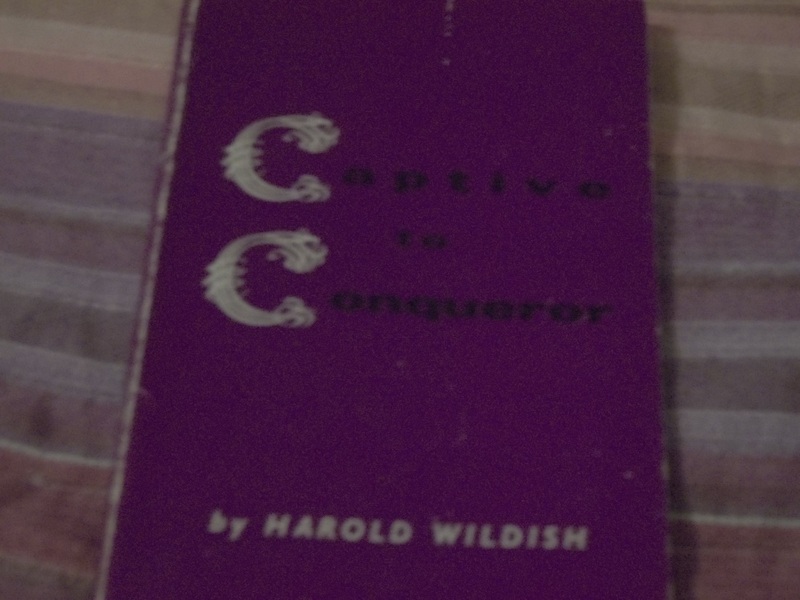 Somewhere or other, I found a copy of a rather unknown book by a Plymouth Brethren missionary named Harold Wildish who died in the early 1980’s. His story is remarkable. This is an English book and its contents are from a meeting at Filey of the Christian Holiday Crusade put on by the Movement for World Evangelization. The speaker, Mr. Wildish, had a topic of Romans 5-8 and Romans 12: 1-11 and that is the content of this book. Each chapter began with the exact Scripture reading and then his exhortations from each passage. He reminds us that the battle of sin and death has already been won by Jesus Christ and of the great truths we need to appropriate from Romans 6 and 7 about being dead to sin, alive to God, and married not to the law, but to Christ. These are teachings we need to sink our teeth down into. For we can’t appreciate the victory that Romans 8 describes without knowing what Christ has done, once and for all, with our sin. One part of the book particularly moved me. Wildish described being away from his wife and preaching in a hot, “sin soaked village” in South America. He said at the time it was one of the hottest spots in the world, and he lived at the time in the back of a building where the mosquitoes buzzed all night and oily food nauseated his stomach. He went down to the muddy Demerara coast that evening, and the slightest breeze refreshed him in his spirit, and gave him the fulness to preach to sweaty, sin filled souls. Somehow, although he felt like quitting, the Spirit touched the hearts of all those who attended his message that night. After he dismissed the group, everyone stayed in their seat, they all wanted to get right with God that night. Two years later, people were still talking how he ministered to them mightily through the Spirit of God. Lives were changed because he persisted through adversity. This book is a great addition to my Bible study tools. 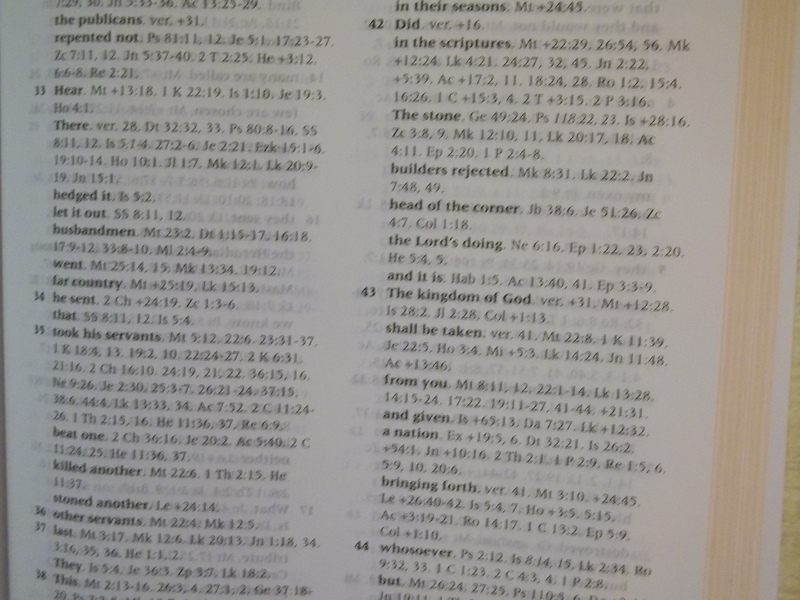 It takes every verse of the Bible, and gives cross-references for some of the words and/or phrases. If you believe that Scripture is the best commentary on Scripture, you cannot go wrong with this resource. For the reference “The kingdom of God,” 5 other references are listed, but three of these have a + sign in front of them. In the front of the book, the explanation for this symbol means that when you go to that reference you will find more verses on the same theme. (Scripture is the best commentary on Scripture!) So you will find more on “The kingdom of God” when you look up those references, which will lead you to more references. In other words, you can get happily lost in the Word of God. The next group of words “shall be taken” has nine references listed and two of these also have the + sign, meaning there are more references on the same theme when you go to the verse listed. On and on these references go with more + signs frequently intermingled among them. I do not like to just take someone’s word that a particular teaching is correct, but am persuaded I need to come to my own conclusions through the Word of God. This resource helps me to do just that. Another thing I like is that the paper quality is fine, it doesn’t feel like cheap newsprint. The book is nicely bound in sturdy hardback edition. I got mine off Amazon after reading good reviews there, and have not been disappointed. The book is based on the KJV of the Bible. Nelson’s Cross Reference Guide to the Bible is published by Thomas Nelson, copyright 2007. If I could tell of one cookbook I leaned on more than any other during the years when I was raising my family, it was this simple cookbook, published by a Mennonite woman back in 1976. 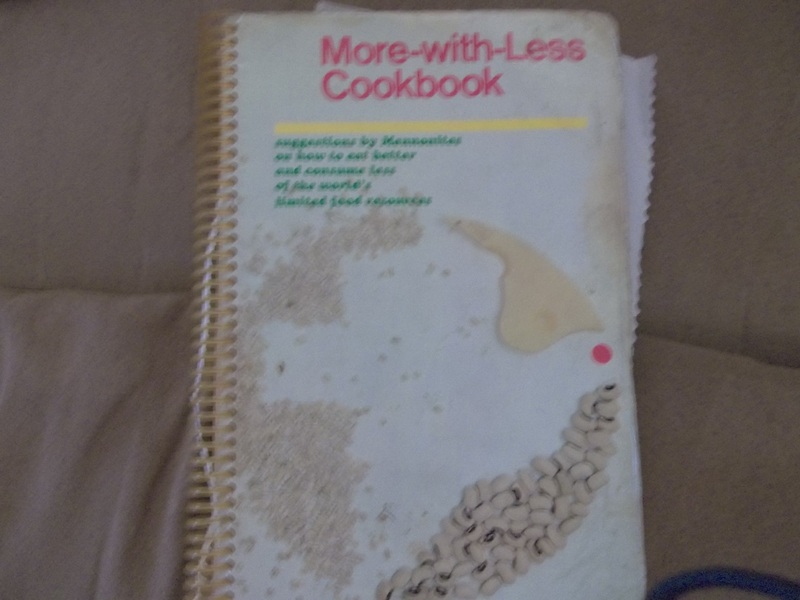 This simple spiral bound cookbook was a great friend to me as I searched for nutritious, and compassionate recipes thoughtful of others in third world countries. Mennonite women sent the recipes to the author. Doris told of how Americans use so much sugar. She gave the statistic that Americans ate 120 lbs. of sugar and refined sweeteners yearly. And this was nearly forty years ago! I wonder how much more it is now. She made me think about poorer countries. Doris suggested having one meal weekly as a “meager meal” so that we who had plenty would be mindful of those who did not. (A meal like beans and rice would qualify as a meager meal.) This also helps children to learn that not everyone in this world goes to bed with a full belly each night, so it is a great teaching tool. My kids loved the recipes, and some have become family traditions: Honey Baked Lentils (on page 106), Vietnam Fried Rice (p. 130), Basic Corn Bread (p. 78) and Tangy Tuna Mac (p. 123). In the recipes, Doris was mindful not to overdo it on meat or sugar. At the end of each chapter of recipes, she featured a “Gather Up the Fragments” section which told of handy ways to use up leftovers, so that excess food would not go to waste. Also there are handy recipes for home-made granolas, soap, play paste for children, all kinds of handy little information for saving money and being frugal. You can probably guess that my copy is pretty tattered by now, and it has a little love note from my daughter on one of the recipe pages. When I was a young bride, another young bride who happened to be a classmate of mine at nursing school, told me how much she loved this wonderful recipe book. So, even though it is old, I am sharing it now with you. If you read this book with its handy info, you will save money and hopefully restore a sense of serenity to our crazy, overburdened lives. One last disclaimer: Doris gives recipes for soy and talks about it being a good protein replacement. However, there is some controversy with soy, estrogen and breast cancer, so do your own research on that. I perchance found this little gem at a yard sale or library sale. My edition is dated 1981, but it is originally from 1954. I am sure most people know Margaret Wise Brown. She is the author of the famous Goodnight Moon, which many have known and loved and shared with their children. This book is also very sweet. It reminds me a little bit of Richard Scarry books, because the beautiful full color illustrations have little dogs riding in cars, on trains, rabbits riding in boats, etc. There is a rhythm to the theme of “I like…” First is cars, then trains, then stars, snow and more. Each item liked has its own little verse to accompany it. One neat thing is she lists different kinds within each category. This would be a great way for a parent to interact with their child as they read the book. The child can identify them. For example, on a two page spread there are many colorful dogs. She writes of six kinds: big, fat, old, little, doggy, and puppy dogs. The parent can ask the child to identify all the little dogs on the two page spread. Then, you could count them together. Then you could work on colors. “How many little dogs are wearing blue?” In other words, parents can use this book to help not only with language skills, but colors, counting, and discrimination. Children will like it because the colors are bright and the rhythm is inviting. It is especially nice when the parent can add some expression to the words, which could easily be done here. 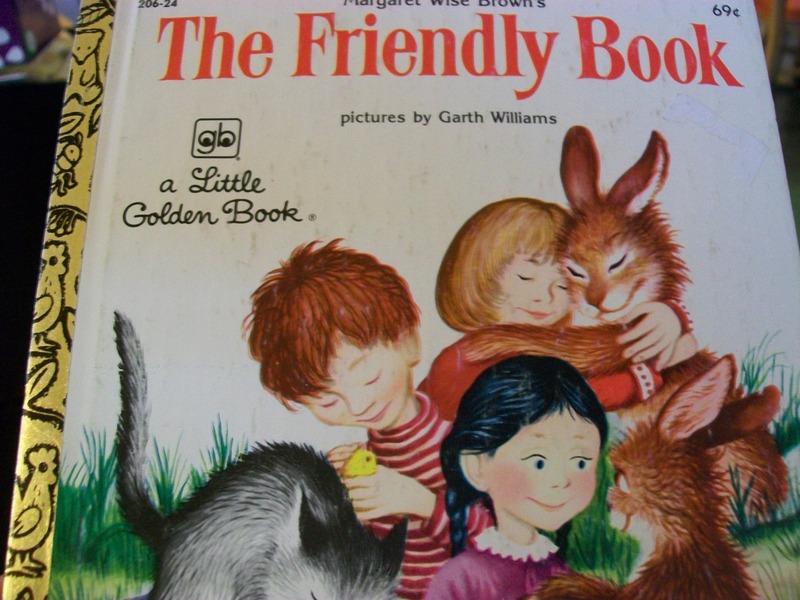 So, if you are able to find this old book, it will provide a chance to turn off the TV, the phones, and just sit down with your preschool child (who is absorbing facts like a sponge) and have some quality time together.